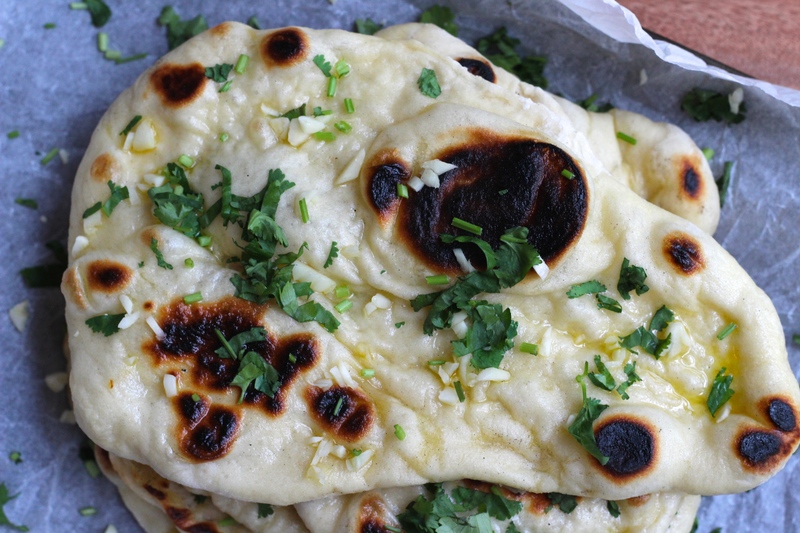 Makes 6 Naan breads. Takes 45 minutes, plus 1 hour proving time. In a small bowl, mix together the vinegar and yoghurt, and leave to sit for about 5 minutes. In another bowl or jug, add the yeast, honey and water. Mix with a fork and leave for a few minutes until it starts to bubble. In a large bowl, add the flour and salt. 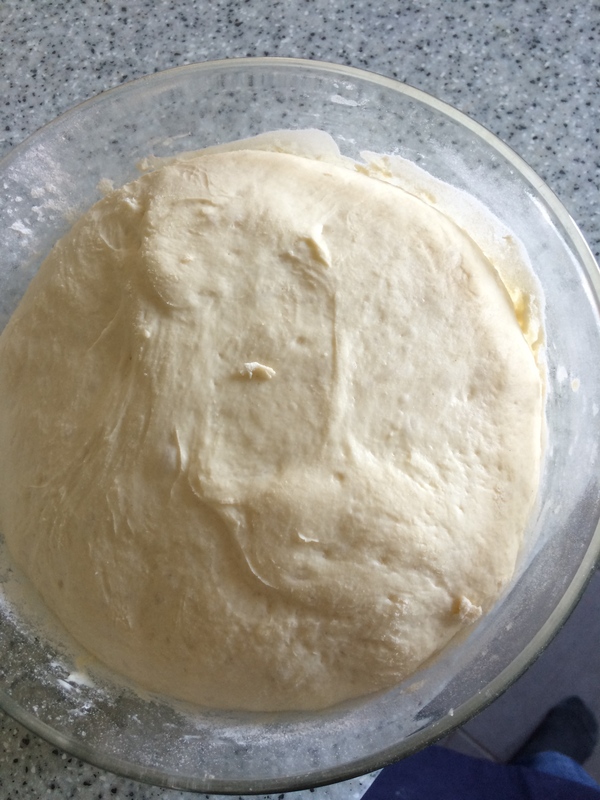 Make a well in the centre and add the yeast and yoghurt mixes, plus 1 tablespoon of the melted butter and start to bring the dough together. Leave the remaining melted butter aside. On a very lightly floured surface tip out the dough, and knead for about 5 minutes. 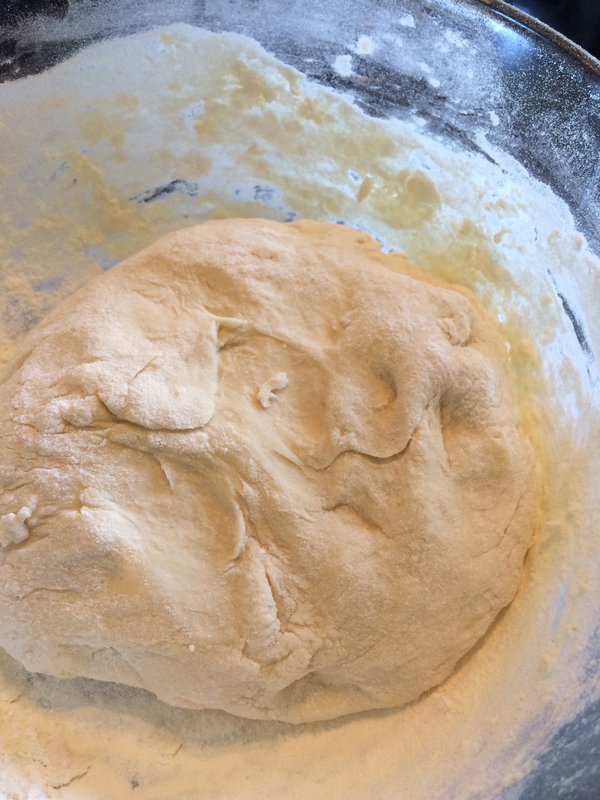 The dough is very soft and so is best kneaded following the Richard Bertinett technique- watch what I mean here: https://www.youtube.com/watch?v=kXV8mayG3W0. 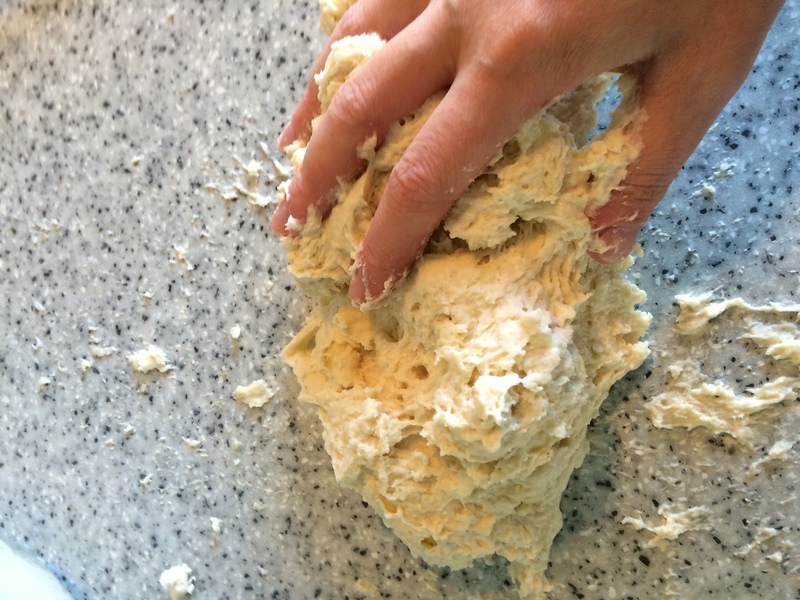 Although it will stick to your hands a lot when you start, as you knead and the gluten gets stronger, it will begin to ‘clean’ the work surface and your hands. 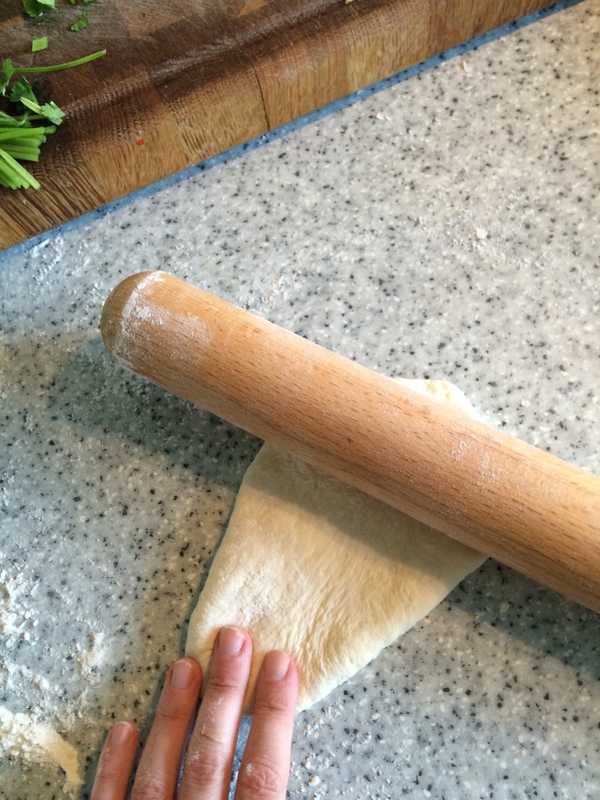 Stop when the dough is smooth and almost all the dough has been cleaned off the work surface and your hands. Lightly flour the bowl you started the dough in and place it in there to prove. Cover with clingfilm and leave at room temperature for about an hour until the dough has risen to at least twice it’s size. 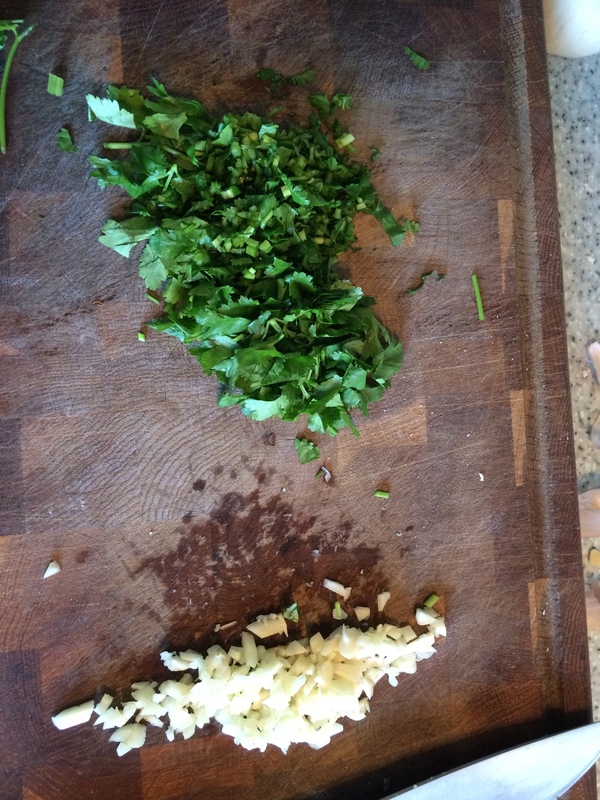 Finely dice the garlic cloves, finely chop the coriander stalks, and roughly chop the coriander leaves. 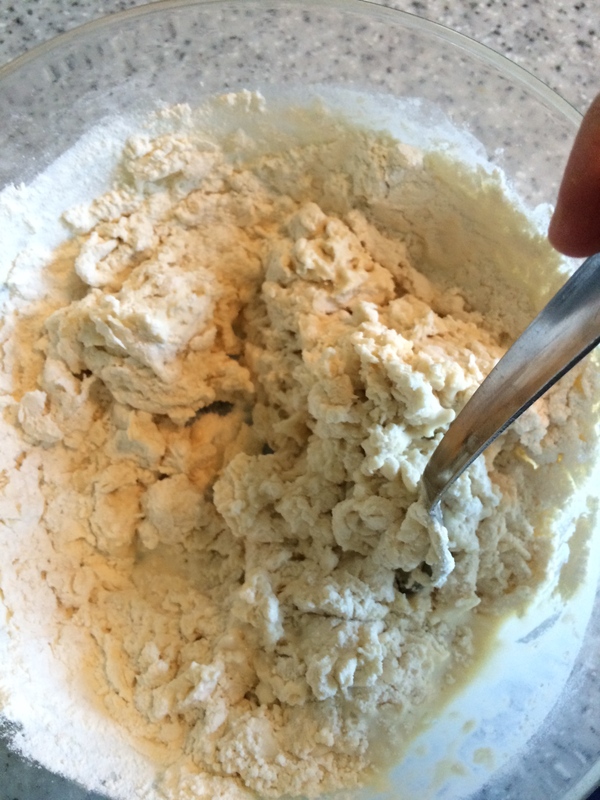 When the dough has risen, tip it out of the bowl onto a lightly floured surface, and cut into 6 equal pieces. Roll each piece into a ball, and leave for a few minutes whilst you get out a heavy based non stick frying pan. 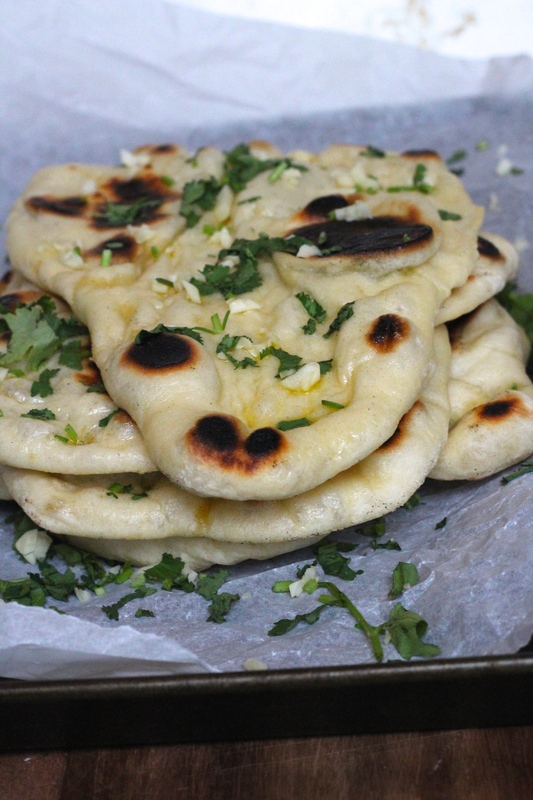 Place over a medium – high heat and wait until it gets very hot. 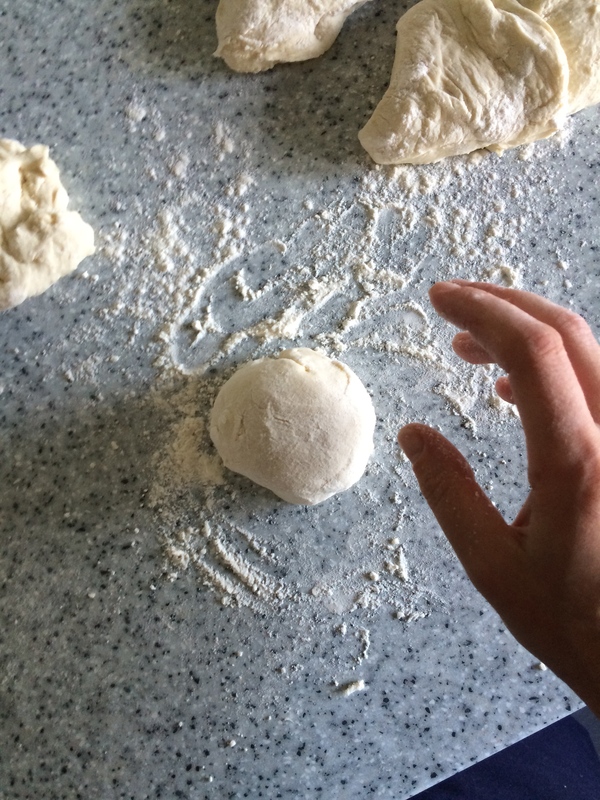 On a lightly floured surface and using a rolling pin, roll each ball of dough into a rough oval shape, roughly half a centimetre thick. Pull it off the surface at one of the oval ends, turning it from an oval shape to a tear drop shape. 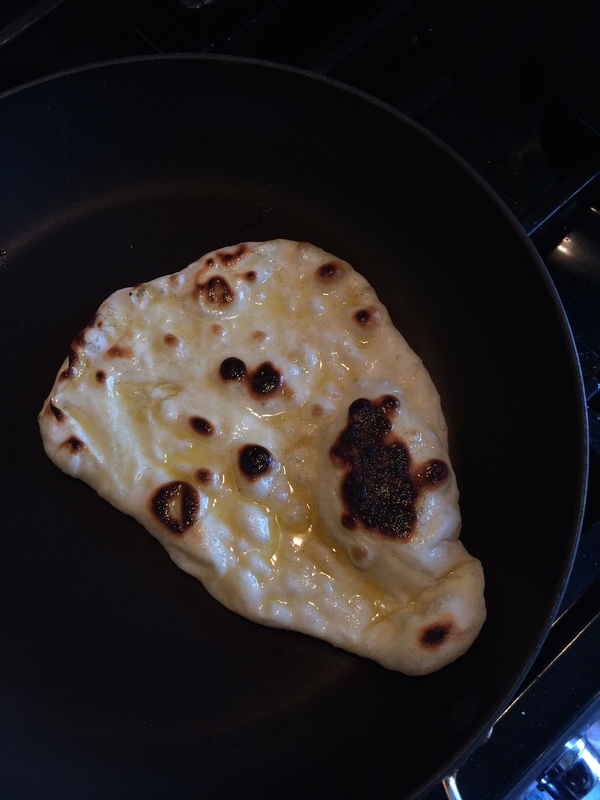 Place into the dry, hot pan. 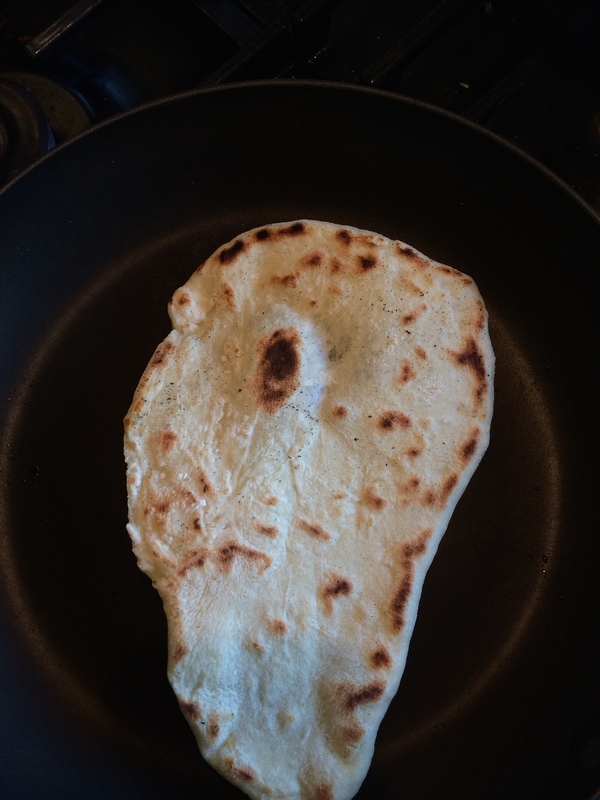 Leave to cook for 2 – 3 minutes on this side. It should get very brown on the bottom, and the top should start to bubble. 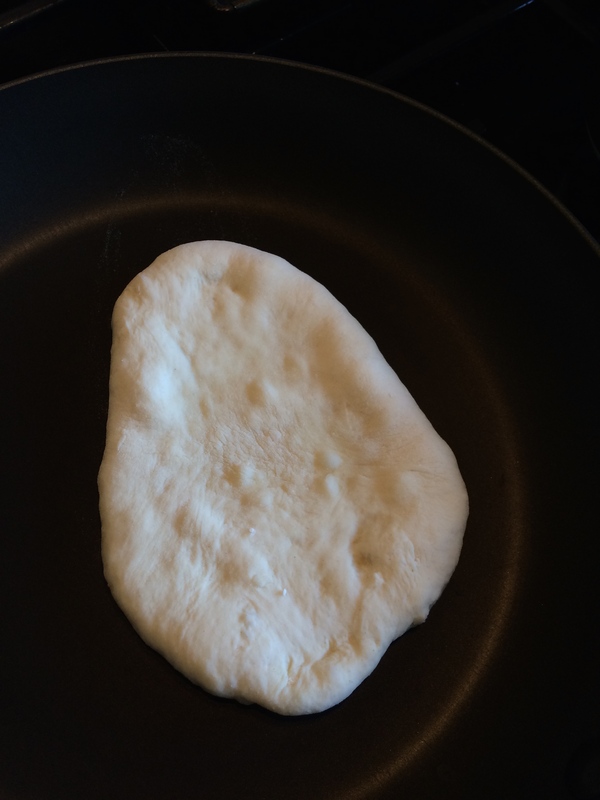 Turn over so it is now bubbly side down and continue to cook for another 1 – 2 minutes, until charred. 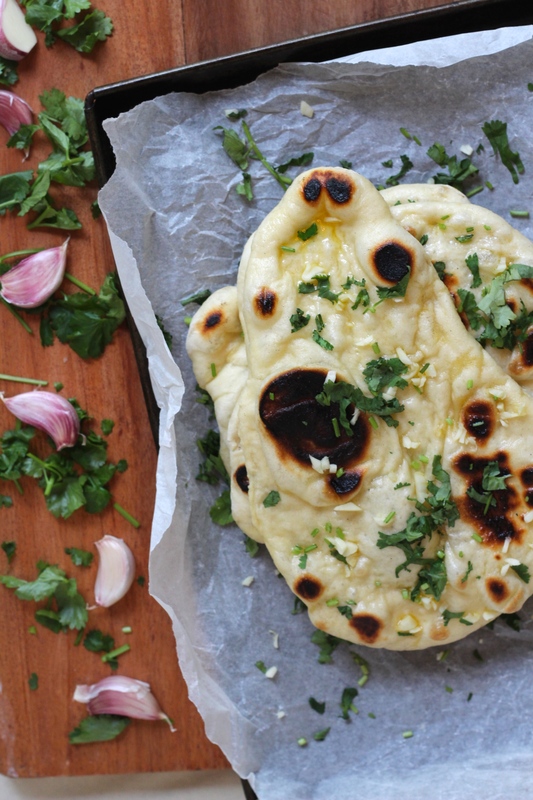 Remove from the pan, and place onto a serving plate. 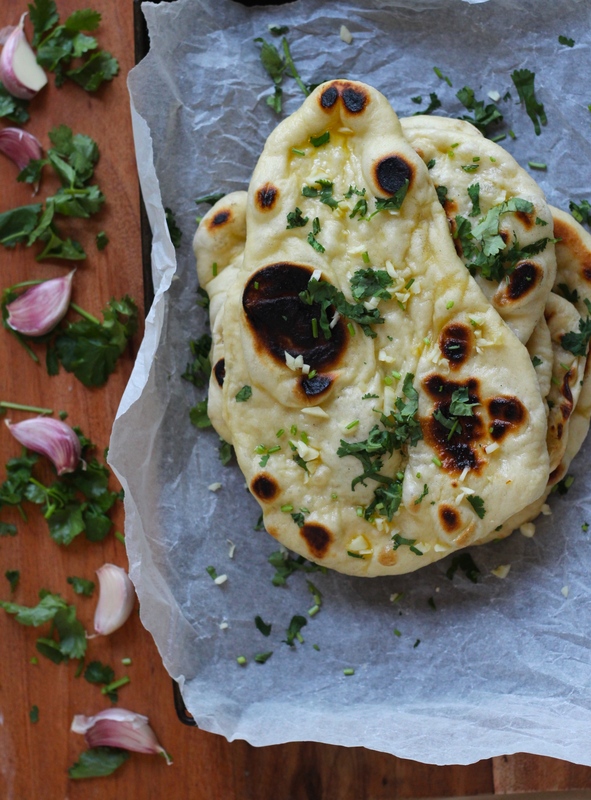 Immediately brush over the bubbly and charred side with the melted butter, and generously sprinkle over the garlic and coriander. Cover with foil to keep warm. 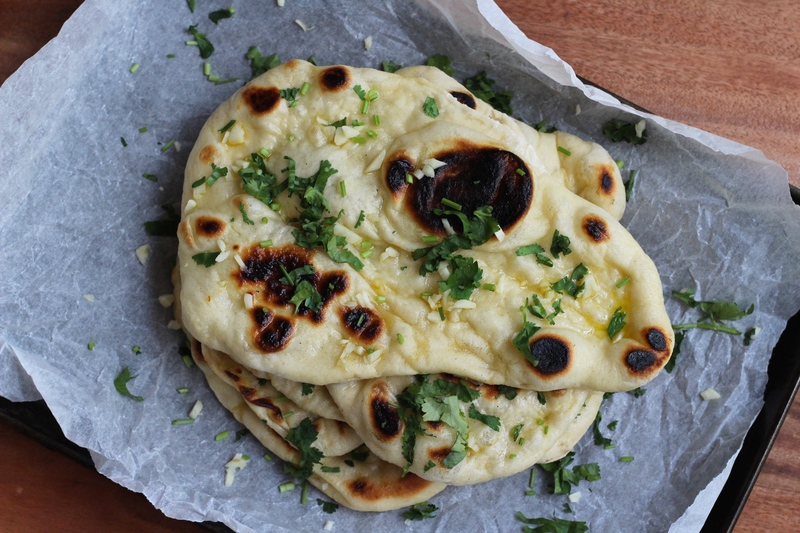 Repeat steps 9 – 11 until all 6 naan breads are cooked. 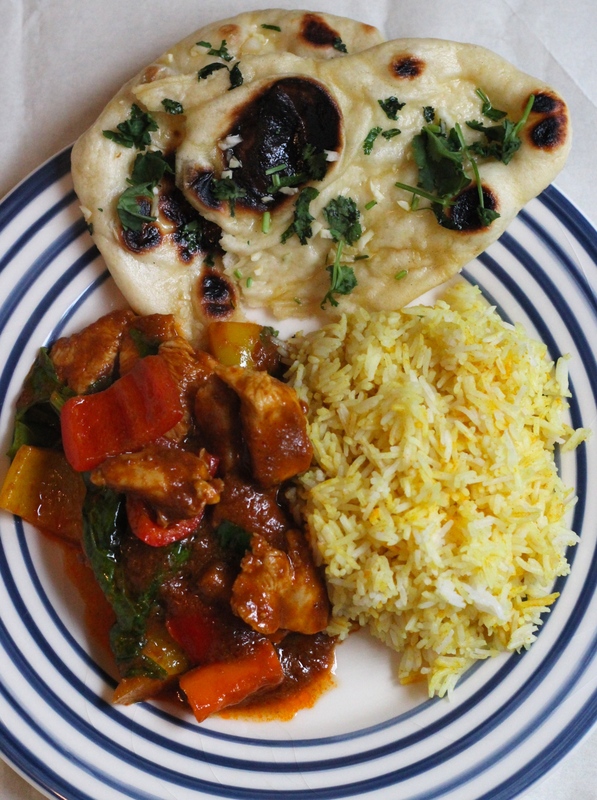 Serve alongside your favourite curry recipe.